Since its introduction in 2011, the P2X Fury has become one of SureFire’s most popular handheld flashlights and has spawned an entire family of products, each with the same 500 lumen maximum output. 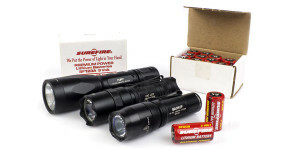 At the time of their introduction, the Fury line of flashlights were the first, and only, SureFire flashlights capable of producing 500 lumens powered by only two CR123 lithium primary batteries. P2X-A-BK: Single output version of the Fury equipped with a standard press for momentary, twist for constant-on switch. P2X-B-BK: Dual output version with a click-type switch which allows the user to partially press the switch for momentary-on low output or press further, until it clicks, for constant-on low output. 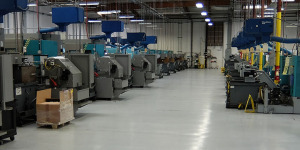 The high output mode can be accessed by returning to off and pressing or clicking again within 2 seconds. P2XD-A-BK: Single output version of the Fury equipped with a standard press for momentary, twist for constant-on switch. Features a crenelated strike bezel similar to the design found on the 6PX Defender and 6P Defender series lights. P2ZX-A-BK: Single output version of the Fury equipped with a standard press for momentary, twist for constant-on switch. Features the same CombatLight body design found on the Z2X. Depending upon the model, MSRP of the two cell Fury lights varies from $155 to $175 with retail prices ranging from $108 to $125. All models have a high-strength aerospace aluminum body with a Mil-Spec hard anodized finish and are available only in black. This review is based upon the two-mode P2X-B-BK Fury which I purchased approximately 14 months ago. From a design standpoint, the P2X Fury follows the style established by the 6PX family of lights with six deeply machined finger notches replacing the extensive knurling found on older SureFire lights. Although the body has an overall smooth finish, grip is surprisingly good in under and overhand grips due to the finger notches and the matte finish of the anodizing. I was pleasantly surprised to find the Fury is not as slick to hold as it may appear in photos. The finish is very even, with no obvious blemishes or variation between the head, body, and tail cap. When compared to the 6PX, the Fury is easily distinguishable due to its larger head, designed to accommodate the more powerful LED and larger reflector. 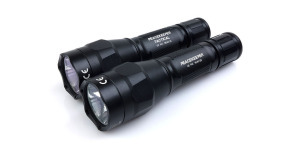 Measuring 1.37″ (34.8 mm) at the bezel, the P2X is able to use the same beam filters, diffusers, and covers as several of SureFire’s LED weaponlights, including those from the RAID and Millennium Universal series. As with the 6PX family of lights, the head of the P2X Fury is not intended to be removed by the user and is secured to the body using a thread-locking compound. A gasket at the head and o-ring at the tail provide a weatherproof seal. The tail cap threads on and off easily and can be “locked out,” to prevent accidental activation, by unscrewing it just over one-quarter turn. Housed behind a coated, tempered glass window, the Cree XML’s output is focused by a micro-textured reflector. 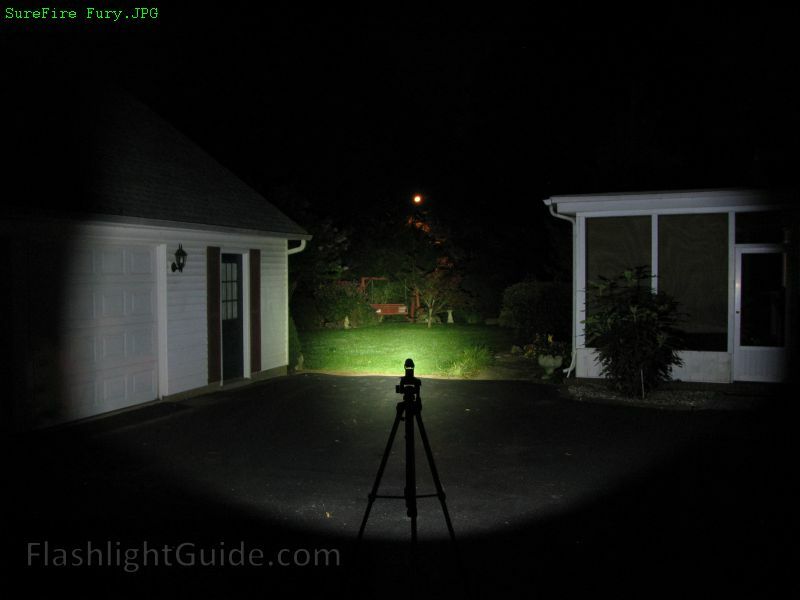 The P2X Fury lives up to its billing as a pocket-sized searchlight and is capable of illuminating a huge area with a wall of light. The beam is balanced, neither a spotlight nor a floodlight, and is able to illuminate distant targets while allowing the user to maintain their peripheral vision. The textured reflector produces a smooth beam and very even spill with no visible artifacts or rings. With its 500 lumen high mode, the Fury is ideal for medium to medium-long range spotting, and provides plenty of reach to make out fine details well beyond 200 feet. The 15 lumen low mode is more than adequate for up-close tasks and allows for considerably longer runtime. The following slides shows a comparison of the PX2 Fury to a variety of other lights, including some that are much larger and/or more powerful. 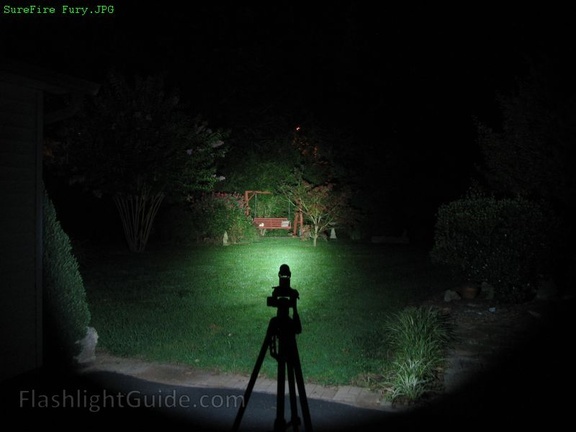 The beamshots can be compared across the full width of the image using the slider, while additional images can be accessed by using the navigation buttons in the bottom-right corner. The P2X Fury can be powered by two CR123A lithium primary batteries or two LFP 123A rechargeable cells. Runtime tests were conducted with both types of batteries. When operated with lithium primary batteries, the Fury maintained at least 80% of its initial output for over three-quarters of an hour before beginning a long taper as the batteries became depleted. After the light drops out of regulation there is ample runtime to allow the user to recognize the decline in output and change batteries or switch to their backup light. Using LFP123a rechargeable batteries, the P2X was able to provide slightly greater output but for a much shorter duration. As the LFP123a cells become depleted, output drops sharply, over the course of 3 minutes, until the light begins blinking on and off. While operating the P2X Fury for extended lengths of time it becomes obvious the the light runs quite hot, with the exterior of the head and body reaching temperatures above 130 degrees Fahrenheit. The following chart shows the temperature rise over the course of a runtime test using lithium primary batteries. It should be noted that these results were obtained while the Fury was secured in a holder, with limited air movement, for the duration of the test. Although the measured temperatures are above what most people could hold comfortably, they are much less likely to be an issue in actual use. Over the course of the past 14 months, the P2X Fury has been one of my most regular and consistent “go to” lights. Generally speaking I would describe the Fury as somewhat like a floodlight, due to its wide intense beam, but one that also throws quite well. 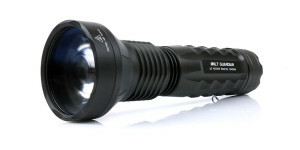 As a result I consider the P2X to be more of a utility type of light which also has tactical uses due to its high output. With its 1″ body, the Fury is easy to operate and comfortable to hold, both bare-handed and with gloves. The click-type switch provides plenty of travel to reliably operate the P2X in momentary mode and positively clicks into constant-on mode. After being thrown around for over a year, the Fury still looks nearly new with only a few minor nicks in the anodized finish visible upon close inspection. Measuring only 5.4″ in length and weighing less than 6 ounces, the Fury is light and compact enough to be easily carried in a pocket or store in a glove box. For those who prefer holster carry, a wide variety of leather, nylon, or tactical holsters are available from SureFire and other manufacturers. When used continuously for an extended time, the Fury can reach temperatures that approach the limit of what can be comfortably held. For some users wishing for 2-modes of operation, the fact the Fury comes on in low mode first could be a drawback. One of the things I ask myself, when considering the value of a tool, is whether or not I would replace it in the event it were lost, destroyed, or stolen. With its combination of output, form factor, beam characteristics, and price my answer for the P2X Fury is a resounding “yes.” It is one of the most useful lights I have owned. 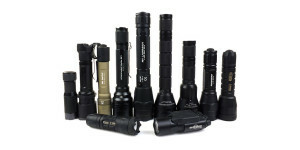 Additional information about the SureFire P2X Fury can be found on the SureFire website. Please share your thoughts and feedback in the comment section below. If you’re asking about the lens, there is an anti-glare coating.